September | 2011 | Chickens Don't Clap! From the ashes of San Diego band Da Bears arises DUDES. Fresh off the July release of Narcissists Anonymous, they laid down a slick — barring a bit of a tuning hiccup — and enjoyable set at last weekend’s San Diego Music Thing. The songs on their latest are a sweet, layered mess of Korg-laden psych-pop that dips into a myriad of other genres and refashions disparate, borrowed bits and pieces into DUDES’ own uniquely warped vision. Check out my favorite track, “Who’s That Lady? (We’re All Anonymous)” and follow the Bandcamp link below to get yourself a copy of Narcissists Anonymous. 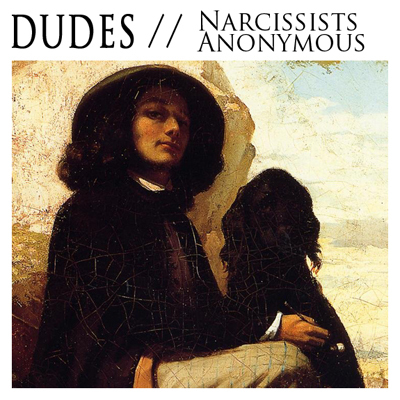 Buy: Download Narcissists Anonymous for free, or buy the cassette for $5, over at DUDES’ Bandcamp.